Russell has been interested in birds and wildlife since childhood. He started working with Santa Cruz Predatory Research Group in 1983, the California Condor project in 1986, and The Peregrine Fund in 1988. Russell's Peregrine Fund career started as a member of the Maya Project in Guatemala where he described the first nests of the Barred and Collared Forest-Falcons. In 1993 while working for The Peregrine Fund in Madagascar, Russell rediscovered two species of raptors – one of which, the Madagascar Serpent-Eagle, was thought to be extinct. His work in Madagascar fostered the establishment of the country's largest national park, which is intended to conserve habitat and biodiversity. Recently Russell began working in the Caribbean, where he is researching the ecology and distribution of two endangered species, the Grenada Hook-billed Kite and the Ridgway's Hawk, and in Brazil researching the endangered White-collared Kite. Russell has worked as a biologist in 12 countries. He received his MSc in biology from Boise State University and his BS in Wildlife Biology from Washington State University. He has published and co-authored over 50 articles in ornithological journals. 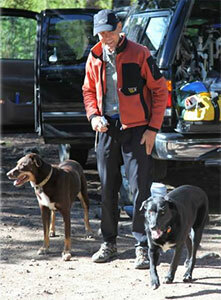 Russell has a keen interest in nature and bird watching, cycling, running, hiking, and photography.